The kid from Charleston embraced failure and developed one of the world’s most influential comedic minds. Stephen Colbert may be one of the most beloved men on late night television, but the path there wasn’t always easy. From an early childhood marked by a life-changing tragedy, to struggling to find work in Chicago, to “learning to love the bomb” and finally arriving on — and dominating — late night television, Colbert has led a fascinating life. Here’s a five-minute look at how Colbert made it from South Carolina to New York City and amassed a fortune. Stephen Colbert was born on May 13, 1964 in Washington, D.C., although he mainly grew up on James Island and in downtown Charleston, South Carolina. He was born to a huge, devout Catholic family, and was one of 11 brothers and sisters. His father, James William Colbert Jr., was a doctor specializing in immunization and the vice president of a local medical school, while his mother was a homemaker. If you ever notice Colbert straining to hear a guest, it’s because he can’t hear in his right ear. As a kid, there was something wrong with his ear, so “they scooped it all out with a melon baller,” as he once told David Letterman. The surgery also put a lid on his youthful aspirations to become a marine biologist, since he wouldn’t be able to scuba dive. Everything about Colbert and his family changed on September 11, 1974, when Eastern Air Lines Flight 212, attempting to land in dense fog, crashed three miles short of a runway in Charlotte. Seventy-two people were killed, including Stephen’s father and two brothers, Peter and Paul. Stephen was 10 years old. His mother relocated the family from James Island to downtown Charlotte. Separated from his childhood friends and feeling disassociated with the world, Stephen buried himself in science fiction and fantasy novels and picked up Dungeons and Dragons (he played a witch). “Nothing made any sense after my father and my brothers died. I kind of just shut off," he told The Post and Courier. While Colbert does come from a huge family, it was mostly just him and his mom after the plane crash. The rest of his siblings were significantly older and off to school or had moved out (Peter and Paul were closest to him in age). So he used comedy to help cope, both in school to make friends, and at home to keep his mother happy. “I was there with my mom, she was there for me, and I sort of kept her going,” Colbert told Howard Stern. In turn, his mother taught her son how not to let tragedy leach the joy out of life. “And by her example am I not bitter. By her example. She was not. Broken, yes. Bitter, no,” he told GQ. He graduated high school with a litany of extracurricular activities. Check out his yearbook page. After spending two years at Hampden-Sydney College in Virginia, Colbert transferred to Northwestern University in Evanston, Illinois. There, he completed a three-year acting program in two years and worked two student jobs: one in the cafeteria line and one doing computer data correction. After graduating, he headed to Chicago. In Chicago, Colbert applied for a graduate program in drama at a school in New York, but decided to hang around the city for a while and pursue acting gigs instead. One year later, he applied to the same school once again. "I was like, 'Oooh, I have ruined my life.' And right then is when I started to improvise,” he said, according to the Chicago Reader. And by improvise, he meant it literally. Colbert attended Second City, a famous Chicago improv group where he worked alongside Chris Farley, Steve Carell and Amy Sedaris. While living in Chicago, Colbert picked up odd jobs to make ends meet. One job was waiting tables. “Everybody should do it to see what it’s like to serve someone else, and not be able to answer in kind when someone is unkind to you,” he told Oprah. And he speaks from experience. He said the most he ever made in a week at the now-shuttered restaurant called Scoozi was $250. Meaning, you had to embrace it when you fail. You had to literally start enjoying it. “You gotta learn to love when you're failing...The embracing of that, the discomfort of failing in front of an audience, leads you to penetrate through the fear that blinds you,” Colbert told GQ. Sometime in 1990, Colbert had been dating a woman for a few years when she basically gave him an ultimatum to get married. Colbert took some time to think about it and went back to Charleston to visit family. After attending a play, he spotted a girl that he thought he never saw before and starting chatting her up. Turns out, they had grown up together. Which was embarrassing at first, but they fell in love and married in 1993. Watch his in-depth tale about getting together with Evelyn McGee-Colbert. After about eight years in Chicago, Colbert — who never went back for that graduate degree — headed to New York City for a 1995 sketch show on Comedy Central called “Exit 57,” which starred several other Second City vets. The show only had 12 episodes, but received favorable reviews. 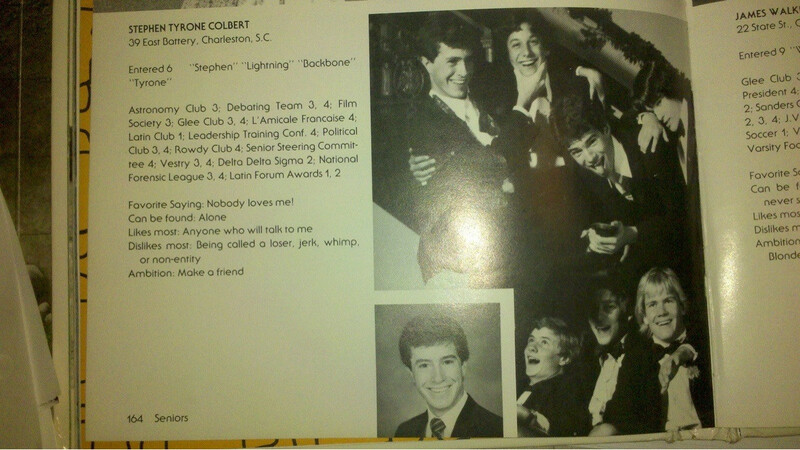 Colbert also co-created and starred in the cult classic show “Strangers with Candy,” also on Comedy Central. In 1996, he worked on “The Dana Carvey Show,” but that was a short-lived and spectacular failure. Colbert was hard up for cash. “I had been working for ABC at 'The Dana Carvey Show’ in 1996. That show got canceled, my wife wasn’t working, and we had a baby. I desperately needed a job,” Colbert told Vanity Fair. Colbert actually got to the “The Daily Show” during Craig Kilborn’s second season, well before Jon Stewart. And he didn’t expect it to last. “They had me on for a trial basis, and for the next nine months I worked at ‘The Daily Show’ occasionally, during Craig Kilborn’s second year. But it was totally a day job. I never expected to stay, because I did sketch comedy and I wrote, and I really didn’t think that [it] was going to go anyplace,” Colbert told Vanity Fair. Colbert actually auditioned for the host of “The Daily Show” after Craig Kilborn left in late 1998, but ended up back in a correspondent position with Jon Stewart at the helm. The two hit it off, and the show itself gradually picked up steam. While it received critical acclaim after its debut, it wasn’t until the following year that Colbert became a household name, when he was invited to be the comedy act at the 2006 White House Correspondents’ Association Dinner. It was shortly after this brazen lampooning of President George W. Bush, who sat just a few feet away, that Colbert’s fame skyrocketed. People searched his name more than Jennifer Aniston, clips of the correspondents’ dinner reached 2.7 million in two days and his performance reached No. 1 in the iTunes store. When Colbert accepted “The Late Show” crown in 2015, he actually took a pay cut. CBS is rumored to have given Colbert a three-year, $4.6 million-per-year contract, significantly less than the $20 million price tag it paid for David Letterman. In late 2016, one year after “The Late Show With Stephen Colbert” debuted, ratings were good, but Jimmy Fallon was still far and away the king of late night talk shows. Then Donald Trump became president, and Colbert’s viewership picked up. By 2017, Colbert was No. 2 in late night with 2.75 million viewers compared to Fallon’s 3.618 million. By April 2018, Colbert’s show claimed around 3.88 million total viewers during the 2018 season — Jimmy Kimmel had pulled in 2.3 million and Fallon pulled in 2.78 million. Colbert now earns $15 million per year. • Raised $170,000 for the Yellow Ribbon Fund, a charity for injured service members. • Fulfilled every grant request made by South Carolina public school teachers on DonorsChoose.org, to the tune of $800,000. • Helped raise $1 million for hurricane-ravaged Puerto Rico. • Raised $50,605 for Save the Children by selling a framed portrait of himself. • Donates all his profits from his “AmeriCone Dream” Ben & Jerry’s ice cream flavor to charity. • Created a super PAC during a mock 2012 presidential election run, then donated its $773,704 in funds to charities for Hurricane Sandy relief, Team Rubicon, Habitat for Humanity, Yellow Ribbon Fund, the Campaign Legal Center and the Center for Responsive Politics. Accolades include the 2014 Grammy Award for Best Spoken Word Album (for “America Again”) and 24 weeks on the New York Times Best Sellers list (for “I Am America”). He also helped create “Stephen Colbert’s Tek Jansen,” a five-issue comic book series. Colbert’s estimated net worth is now $45 million. While “Late Night with Stephen Colbert” is his main money maker, the comedian is also the producer of a Showtime animated series “Our Cartoon President,” which parodies President Donald Trump.